208-24433 Target Hybrid 6mm 105 gr. 208-30426 Target Hybrid .308 155 gr. 208-30425 Target Hybrid .308 168 gr. 208-30424 Target Hybrid .308 185 gr. 208-30427 Target Hybrid .308 200 gr. 208-30429 Target Hybrid .308 215 gr. 208-30430 Target Hybrid .308 230 gr. *$7.95 Shipping - Mix and Match Bullets Only Up to 15 lbs will Ship USPS for Only $7.95. Click Flat Rate Bullets for More Information. Berger Bullets are not just for competition target shooters. They make Match Grade bullets for hunters and varmint shooters too. The secret to Berger Bullets accuracy is the exclusive J4 bullet jacket. These jackets have a wall thickness that's consistent to within .0003"... That's 3/10,000ths of an inch. This is a big part of Berger Bullets overall consistency and why they're able to achieve "Match Grade" accuracy from hunting and varmint bullets as well as target bullets. Another term you'll see here is "VLD". VLD means Very Low Drag... Bullets with high ballistic coefficient so they will fly with flatter trajectory and less wind deflection (videos below). Berger Match Hunting Bullets - The VLD design incorporates a sharp nose that allows the bullet to penetrate up to 3 inches before it starts to expand. This delayed expansion results in a wound channel that is deep inside the vital area of any big game. After the bullet starts to expand it will shed 80% to 90% of its weight into the surrounding tissue traveling as deep as 18 inches. This results in a massive wound cavity that creates the greatest possible amount of tissue damage and hemorrhaging within the vital area (organs). This massive wound cavity results in the animal dropping fast. Classic Hunter Hybrid Bullets - Specially designed to meet SAAMI specs for bullets where Cartridge Overall Length needs to fit a standard magazine length as well as the SAAMI standard chamber. The Hybrid shape (explained below) gives the best possible long range trajectory for rifles where ammo must fit in a magazine. Elite Hunter Hybrid Bullets - These are Hybrid hunting bullets that are not restricted by SAAMI standards. (See Hybrids Below). Berger Match Varmint Bullets - Designed specifically for the varmint hunter. The slightly larger opening in the nose allows the bullet to expand instantly creating the highest possible opportunity for an explosive, one shot kill. The J4 Precision Jacket that we use has a thinner wall at the nose to assist in rapid expansion while it also has a base that is thick enough for high velocity cartridges. 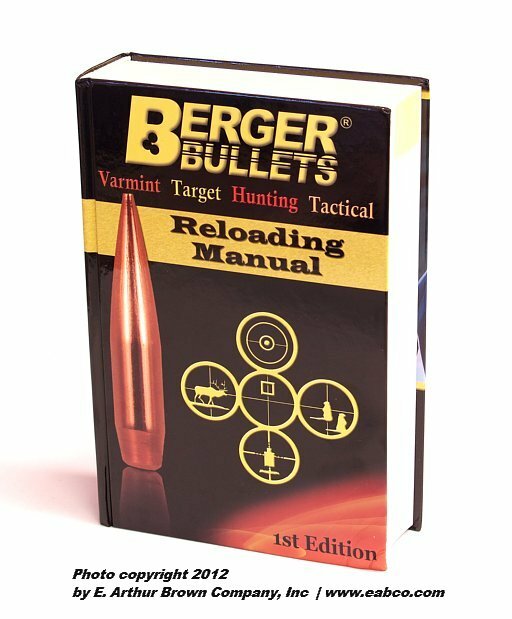 Berger uses the same high-grade materials and techniques to make varmint bullets so you can expect the same tight groups you get from our target bullets. Berger Match Target Bullets - Actually, ALL Berger Bullets are Match Grade, which means that they use the highest quality copper and lead available. The copper is made into the J4 Precision Jacket, which is recognized around the world as the bullet jacket with the best concentricity available (see above). All J4 Precision Jackets and bullets are made on one set of dies to insure that all of the bullets in each box are as consistent as possible. Berger Match Target Hybrid Bullets - Less sensitive to seating depth than pure VLD designs. From the tip, these bullets curve with a Secant (VLD) ogive which blends into a Tangent (conventional) ogive as the curvature of the bullet surface approaches the tail of the bullet. HYBRID Bullet Designs - High BC long range VLD bullets have a "Secant" ogive for low drag. That's good, but the VLD can be sensitive in seating depths close to the rifling. Conventional rifle bullets have a "Tangent" ogive which is less sensitive to seating depth. Berger has introduced "Hybrid" bullets where the bullet nose starts with a Secant ogive and blends into a Tangent ogive further back. This makes for loads that are less sensitive to seating depth but still have the advantage of a high Ballistic Coefficient for long range. We have a more extensive description and a nice video on the Hybrid bullet designs posted a little further down on this page. The full specifications for Berger Bullets include G1 and G7 ballistic coefficients, sectional density, recommended rifling twist, dimensional and bearing surface numbers, meplat, OAL, weight, O-give, etc. Click Berger Quick Ref to see this info. Download to calculate ballistics tables for your rifle and load. 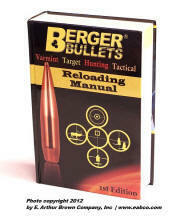 Berger Bullets Reloading Manual... 1st Edition! A quick look at the table contents reveals the expertise and innovation Berger is famous for: A discussion of the variation from lot to lot of gun powder; Powder burn rates; G1 vs. G7 ballistic coefficients; An introduction to benchrest/competitive rifle shooting; Effects of Cartridge Overall Length (COAL) and Cartridge Base to Ogive (CBTO)... Of course there's a massive amount of reloading data on the most popular rifle cartridges (pretty much ALL of the 6.5mm for example). There's basic, beginner reloading instruction as well as advanced techniques of reloading. Combining a tangent ogive with a secant ogive, the Berger Hybrid Bullets are easier to hand load for long range accuracy. Seating .015", .030", .045", and up to .060" off the lands gives pretty much the same excellent accuracy. The video (left) explains how the front of these bullets has a secant ogive like high BC VLD bullets. Then further back, where the ogive contacts the rifling, it becomes a "tangent" ogive... This hybrid combination gives excellent long range ballistics like VLD bullets but is easier to handload for accuracy. At right are two videos we think you'll enjoy. The first shows Berger 140 gr 6.5mm VLD bullets hitting a milk jug at 700 yards in a Model 97D Rifle and using a Ballistic Reticle Scope. The cartridge is 6.5mm BRM and the rifleman is Andrea Giambi. The second video is specifically about Berger VLD Hunting Bullets. Extreme distance hunting shots with devastating results. If you have any doubts about using these bullets for hunting, watch this video! The Hunting bullet line is proving to be the most lethal big game hunting bullets available. All of our Hunting bullets are made in the VLD design. The VLD design incorporates a sharp nose that allows the bullet to penetrate 2” to 3” before it starts to expand. After the bullet starts to expand it will shed 40% to 85% of its weight as shrapnel into the surrounding tissue (internal organ). The combination between the shrapnel and the hydrostatic shock produces a massive wound cavity within the vital area (internal organs) that will be 13” to 15” long. This massive wound cavity results in the animal dropping fast since most go into shock after such a tremendous blow. Those animals that don’t go down immediately will soon succumb to blood pressure loss and/or organ failure producing a quick ethical kill. Our bullets don't poke through like an arrow (high weight retention, deep penetration bullets) but instead dump their energy where it is most effective, inside the animal. Using the Berger VLD will result in an animal that goes down fast so you can enjoy the results of your hunt without having to track the wounded animal after the shot. You owe it to yourself to see how accurate and deadly the Berger Hunting VLD will be on your next hunt. To order a free 30 minute video that provides more detail on the bullets, cartridge and velocity used to take several animals at a variety of ranges call 714-447-5456. Our Tactical bullet line bridges the gap between functionality and the highest possible ballistic performance. Each Tactical bullet is designed with a specific cartridge in mind that is used most commonly in tactical competition and against bad guys. Bryan Litz analyzed the cases and the rifles shooting that case. He then designed the bullets so that they are functional in these rifle’s magazines while still being capable of superior ballistic performance. Additionally, these bullets are made with thicker jackets allowing them to perform reliably under the most abusive conditions found in tactical competition, tactical situations and in combat. The ogive design for these bullets are optimized for their specific application and rifle, which means some have a Hybrid nose while others have a pure tangent ogive. The Hybrid design incorporates two shapes that work together to produce the best trajectory performance while at the same time they do not have to be tuned to a specific seating depth like the VLD bullets. Tactical bullets will be successful at either magazine feedable lengths or loaded long for single shot firing situations which can allow for more powder capacity and higher velocities. These bullets truly give the Tactical user the best possible results for whatever situation in which they find themselves. Our BT Long Range bullets were designed for long distance competitive target shooters. These bullets are made with extra long tangent ogives. This gives these bullets the combined advantage of a high BC while at the same time, they are easier to make shoot than bullets with a secant ogive. The BT Long Range bullets are a recent addition to our line, but they have already proven themselves by setting records and winning major competitions all over the world. The VLD (Very Low Drag) bullet design was born from a request made by the US 300 Meter Shooting Team. It was determined that they were dropping points late in the matches due to recoil fatigue. Bill Davis and Dr. Lou Palmisano were asked to design a bullet and case combination that shot flatter than the 308 case and 168 gr bullets the team was using at the time. After a design was created Walt Berger was approached to make the bullet. The 6mm 105 gr VLD was born and shot by the US 300 Meter Shooting Team using a 2” PPC (modified 220 Swift). This combination shot with less felt recoil and a flatter trajectory than the 308 case using the 168 gr bullet and higher scores were the end result. This successful bullet design soon found its way into all long range target competition and the VLD shape spread into all other calibers. For years we have relayed that it is best to jam the VLD into the lands for best performance. This works for many rifles however there are many rifles that do not shoot the VLD well when the bullet is jammed. We have learned that the VLD can shoot best as much as .150 jump off the rifling. VLD bullets can be sensitive to seating depth and it has been found that these bullets shoot best in a COAL “sweet spot”. This sweet spot is a COAL range that is usually .030 to .040 wide. The quickest way to find this sweet spot is to load ammo at four different COAL. Start with a COAL that allows the bullet to touch the rifling. The next COAL needs to be .040 off the lands. The third COAL needs to be .080 off the lands. The last COAL needs to be .120 off the lands. One of these COAL will outperform the other three by a considerable margin. It has been reported that the VLD bullets don’t group as well at 100 yards but get better as the bullet “goes to sleep” at further ranges. We have learned that by doing the four COAL test you will find a COAL where the VLD bullets will group well at 100 yards. Once the COAL that shoots best is established you can tweak +/- .005 or .010 to increase precision or you can adjust powder charges and other load variables. Frankly, those who do the four COAL test usually are happy with the results they get from this test alone. Our Hybrid design blends the best of both worlds by incorporating two different shapes within the nose. As the bearing surface ends, a tangent ogive begins. This tangent section of the ogive results in the bullet being much less sensitive to seating depth. As you move forward along the tangent portion, the shape changes into a secant ogive (the shape used on the VLD bullets). This shape is very efficient in the wind and is why the VLD became so popular. The key to all this is not just the combining of these two shapes but also the partnership between the ballistician and the bullet maker. Berger’s Chief Ballistician, Bryan Litz uses his expertise to combine the appropriate shapes for optimum performance.